A small watercraft used for transportation, fishing or recreation. Some boats are powered by sail, some by motor, and some by paddles or oars. Merchant sailing ship developed in Maine in the 19th century and designed for maximum carrying capacity with minimal crew size. A sailing vessel of two or more masts, all fore-and-aft rigged. The Thomas W. Lawson, built in 1902, had seven masts. In comparison to a square-rigged vessel of comparable tonnage, a schooner is better for coastwise sailing.. Down Easters found a niche in worldwide shipment of grains and other bulky low-cost cargoes until about 1900, while the four-, five-, and six-masted schooners carried coal up and down the United States’ east coast into the early years of the 20th century. Almost every town around Penobscot Bay built ships. Overall, approximately 3,000 sailing vessels were built on the Bay between the end of the 18th century and 1920. Even islanders built ships, though island fishermen often bought vessels from other places. Most shipbuilding went on in mainland towns, where space, lumber and skilled labor could be more easily found. Calcium oxide (CaO), obtained from limestone, and used in mortars, plasters, cement, bleaching powder, and in making paper, glass, and steel., granite, ice, and other Penobscot Bay products. 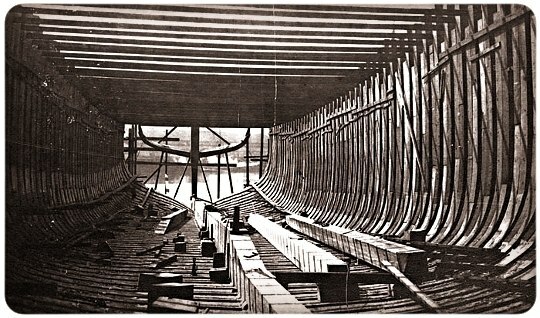 After the Civil War, competitive Maine builders took much of the large shipbuilding business from cities to the south. Shipbuilders who had started by building smaller vessels took advantage of new opportunities to build ships for the deepwater trade with California, Europe, Australia, and the Orient. Mainers kept a financial interest in these ships, frequently providing captains and officers, and Maine ships were recognized in most ports of the world. Investing in them resulted in the wealth that created the attractive towns surrounding the Bay.